Shivpuri is unique weekend getaway from Delhi, its 250 Kms from Delhi and one has to take route via Meerut - Roorkee - Haridwar - Shivpuri. Shivpuri is 16 Kms away from Rishikesh and it is located on Rishikesh Badrinath Highway. Shivpuri is adventure getaway , there are many Ganga beach camps at Shivpuri ,all these camps have tented accommodation on twin sharing ,separate toilets. 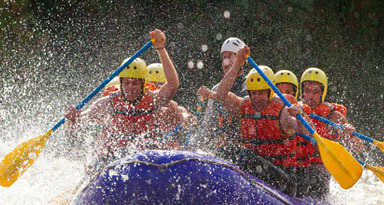 Equipment / rafting gear, instructors and guide charges. Adventure activities like trekking, kayaking, beach volleyball, swimming, birding etc. Transport and expenses of personal nature like tips, laundry, phone calls, etc. Our Camp is located on a white sand beach on the banks of the Holy river Ganga. 16 Kms ahead of the holy city of Rishikesh, the camp is located within the beautiful forests on the Great Himalayan foothills and situated on the bank of the river Ganga ,famous for white water rafting, Ganga beach camp has easy access by car [ parking right in front of your camp]. The rafting camp provides accommodation in 6 alpine tents . Complete care has been taken to ensure that the beach camp conforms to the strictest environmental guidelines and practices. 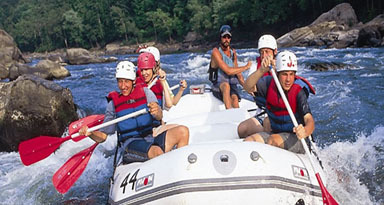 River Rafting, Kayaking, Camping, Bird Watching, Trekking, Rock-Climbing, , Beach Volley Ball, Nature Walks. In Rafting Camp. Specially designed the tents. The sleeping area is approx. 60 sq. feet . All tents are provided with twin beds .We offer attached ground sheets to protect sand and insects from entering the tent. At Rafting Camp. We believe in home cooked, sumptuous meals with a varied choice of Indian, Chinese and continental cuisines. Personal requests if any, can be catered too. Team of highly experienced guides, cooks and management have spared no efforts to make the camp a very comfortable and adventure fun place to be. Guides are highly trained professionals and use the latest techniques and equipment. Arrive early afternoon at our Beach camp at Shivpuri near Rishikesh . After cool refreshments and a wash, change into our rafting gear and depart for your first day on the river Ganga. The drive up to Marine Drive takes approximately 20 minutes. On arrival your instructors will check your rafting gear and give a short introductory briefing about rafting to prepare you for the White Water rafting Run. Your raft run till our beach camp will take approximately two hours during which you will negotiate small but exciting rapids like Cash Flow, Black Money, Three Blind Mice. Hot tea and a warm welcome awaits you at our exclusive Ganga Beach rafting Camp. You have the evening to relax and settle in to your comfortable and cosy tents at ganga beach rafting camps. Time permitted you can go for a short jungle walk. Camp fire & sing song is followed by a buffet spread dinner. An early morning wake up call with hot water is in order if you want to enjoy the clean mountain air and the misty Ganga valley. Early morning walk will take you into some of the last virgin forests in India. A stroll through the dense tropical foliage amidst bird sounds and morning sun rays filtering through the leafy trees is a gentle but strong awakening for us city dwellers. Return to ganga beach rafting camp for a well deserved, hot breakfast. Activities like Kayaking, Swimming, trekking and beach volleyball are at disposal for your use this morning. 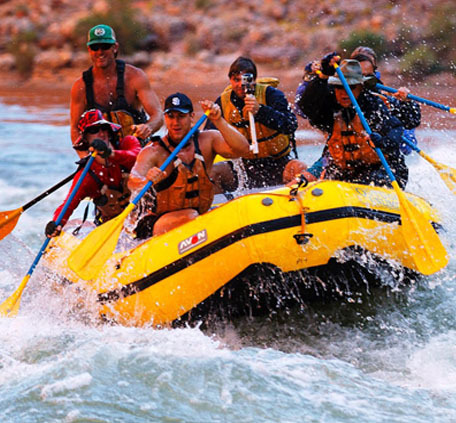 At approximately 1100 hrs you will depart for your most exciting day on the river. Negotiating grade 3 and grade 4 rapids like the Roller Coaster and Golf Course provide for an unequalled and un forgettable experience. Today you will have plenty of time to indulge in body surfing, cliff jumping and sunbathing on the rafts while you gently float down towards the Rishikesh. After coming back to rafting camp on our jeep Your hot buffet lunch will await your arrival. After lunch another relaxed evening on our beach camp. Sing song and dinner is the order of the evening. Today is an early start after breakfast at 0700 hrs. We drive for 45 minutes to our put in point at Kaudiyala. Today, we will negotiate some of the most thrilling rapids on the Ganga. Starting with Daniel’s Dip we finish with a grand finale to your entire trip when we negotiate The Wall. The latter half of your trip is just a scenic float through some of the most beautiful landscape in the foothills of the Indian Himalayas. Finish rafting at Marine Drive. Drive back to the Rapid Action Expedition Beach Camp for a quick lunch before commencing your journey back to Delhi.